ChargeIt by Jay Gold Circus Glitter Glass Round Charger Plate 13"
Home > Products > ChargeIt by Jay Gold Circus Glitter Glass Round Charger Plate 13"
An impressive addition to any upscale dinner setting, the ChargeIt by Jay Round Circus Gold Glitter Glass Charger Plate 12.5" is designed to provide a simple yet elegant backdrop for your specialty dish. 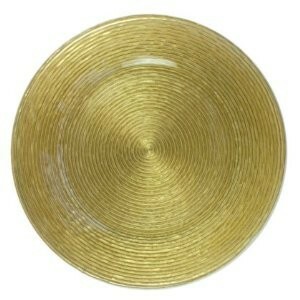 The eye-catching gold glitter and mesmerizing rings of this charger plate adds elegance and texture that will surely impress guests. Perfect for wedding receptions, anniversary parties, or lavish banquets, this charger plate is made from premium quality glass that combines delicate appearance with outstanding durability.